I am Cam of Cambridge! Cam Cam Cam! So, first the facts. 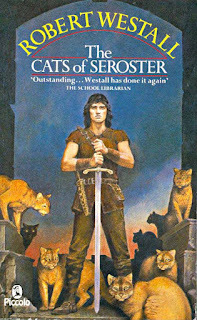 Set in a fictionalized France of the sixteenth century, this young adult fantasy throws an English wanderer, 19 year old Cam, in amongst large, thinking, reasoning cats, descended from lineage that stretches back to Ancient Egypt, called Miw, who have been gently (and not so gently) directing the humans of their city and its surrounds for countless centuries, using their telepathic powers. 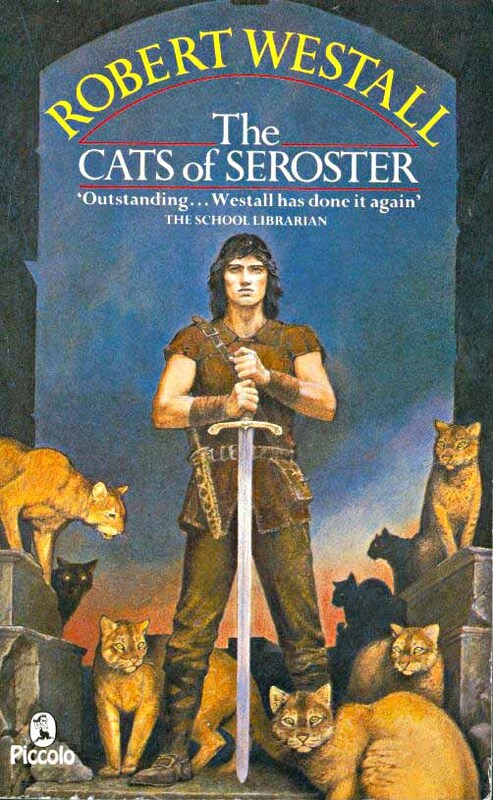 Periodically however, they have had need to call upon the powers of the Seroster, a quasi-mythical warrior and cat-friend, reincarnated as the need arises, and whose gigantic sword and people-slaughtering capabilities are occasionally required to slaughter foes and scatter enemies and so forth. After the usurping of the ducal seat in the aforementioned city by some rather crude and un-cat-friendly types led by a rapacious fellow by the name of Little Paul, the Miw are forced into action, and Cam's part in the story begins! Now the context. Many* might wonder why I've thrown back into the mix another teenage fantasy novel when I've previously made half-hearted apologies for so doing. The reason is very simple: I came across this on a recent trip to Hay on the shelves of the Hay On Wye Booksellers and for the sum of one English pound** it was an opportunity to revisit a nearly forgotten part of my childhood. When I was *mumbles* years old, I got this from the library and simply devoured it. In retrospect I was baffled by what was going on, but it nonetheless inspired me to try my hand at my own, highly (highly) derivative novel, thumped out on the keys of my parents' old typewriter (a love for which has followed me through the years). As I recall I was amazed there were that many words in me. So of course, I was delighted to find it again, having struggled to remember the title on and off for years. And I was not disappointed. It's still a marvellous read, not unduly violent despite all the killing and battles, and a lot of fun. However, I can see why I might have struggled as a young person to follow what goes on, as he leaves quite a bit to the imagination of the reader (bearing in mind I had no imagination as a child). It also ruminates heavily on the subject of death which, as a child, I found darkly exotic and titillating if ultimately confusing. Westall was always a favourite author, and his ghost stories scared the bejeesus out of me when I was a teen, so if you have an older teen who might be a reluctant reader then why not drop this casually on to the sofa when he or she is next face-planted on his or her iPhone and express surprise at its appearance, given it mysteriously disappeared over thirty years ago. Perhaps they will heed its call!